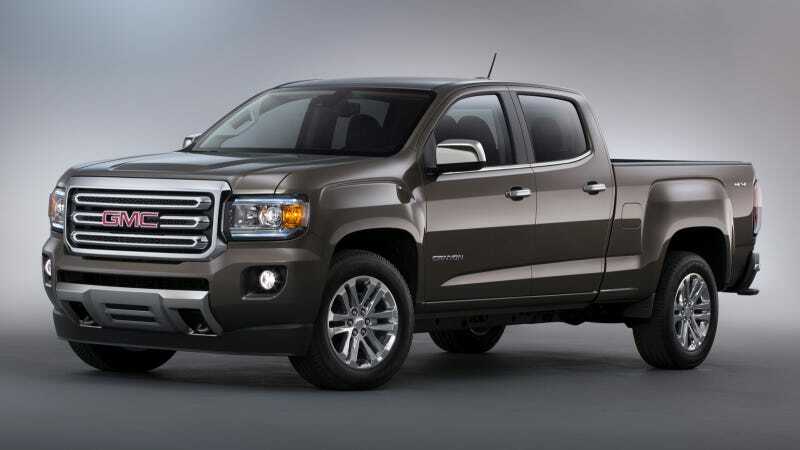 Photos and details of the 2015 GMC Canyon were released at midnight confirming some of our theories, but there will be a manual and it sure does look sharp with that Sierra front grille. Base, SLE, and SLT trim levels will be available, with 2WD and 4WD as options for each. SLE models will have an "All-Terrain" package option that includes a G80 automatically locking rear diff and "specific suspension tuning" though I reckon dealers will sell more of those for the extra chrome bars and 17 inch wheels. Configurations will be an extended cab with a six-foot bed, and crew cabs with five or six-foot bed options. You'll get an extra two feet of loading space with the tailgate down. Interior looks pretty flashy with stitched leather available on the dash, though that automatic shifter seems a bit retro next to that fancy chrome-trimmed leather steering wheel. Powertrain options are the same 2.5 I4 and 3.6 V6 with the six-speed automatic we saw in the Colorado. Underpinnings are the shared as well: fully boxed perimeter frame, coilover front suspension, electric steering. There will be a six-speed manual, but only on the 2WD 2.5. I'm a little disappointed too, but not surprised. Hey, maybe you'll be able to cobble together a 4WD three-pedal setup from GM's global parts bin. Speaking of which, the 2.8 Duramax diesel is indeed going to be available. But just like the Colorado, it's not happening until 2016. Back on the plus side, the Canyon sure does look handsome in these marketing photos. I think I remember GM telling us to expect "a lot more than just a different badge" from the Colorado... alright, I should have said a different grille and bulgy fender flares. Otherwise, the shape is the same. But I do like the way that chiseled front-end offsets the squircliness of the rest of the truck. The bed has a "two-tier" cargo system I'm looking forward to inspecting in person that apparently splits the bed into sections. There are seventeen cargo tie-down locations, thirteen of which are reconfigurable. As we suspected the Canyon will be heavy on tech with OnStar 4G LTE connectivity, WiFi, and other goodies like a forward collision alert, lane departure warning, and rear view camera. There's also a "RemoteLink" smartphone app that will allow owners to unlock, flash lights, and start their Canyon. GMC promises a "diverse collection of work- and lifestyle-supporting accessories will be offered," so hopefully we can look forward to some cool OEM tool boxes and maybe even a camping setup. Hey, they did it on the Aztek! We're going to see the 2015 Canyon in person this evening. Now that you've got the facts and GM's lovely press photos, you can look forward to a subjective Truck Yeah! take on the vehicle soon.